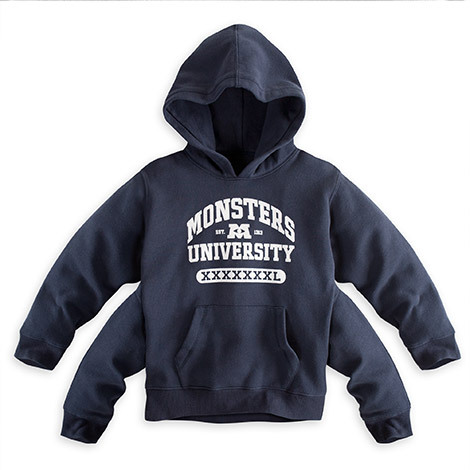 While perusing the official Monsters University store this morning, I was happy to see that we properly predicted (during episode 008 of the Pixar Post Podcast) that the Monsters University 4-arm boys hoodie would be listed in the MU store soon. 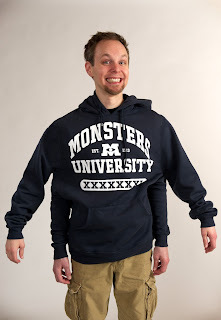 The adult version of the sweatshirt has been available for quite some time now and back in December 2012 we posted a few original photos and wrote our 4-thumbs up review - be sure to check it out here. Scare-up compliments in the quad wearing this 4-arm pullover hooded fleece jacket with the official Monsters University logo and collegiate lettering, for the educated monster in all of us. You can buy the sweatshirt in the official Monsters University store, but be sure to read our post about getting a Monsters University window cling for $2.00 before you buy the sweatshirt.